1.9 and later versions require airbreathercore 1.0.2 or higher. 1.8 and later versions require airbreathercore 1.0.1 or higher. 1.7.10 versions require airbreathercore 1.0.0. Makes adult pigs poop out Manure, which can be used like Bone Meal in the world, can be used as brown dye in recipes, and can be smelted into bricks (same experience as smelting a clay ball). This gives the player a tangible reason to farm pigs instead of cows, chickens, or sheep. Baby pigs do not poop. Obviously, baby pigs poop in real life, this is just to keep the balance on par with similar things. Credit for the idea goes to skidznet. Install Forge (tested with 10.13.2.1230 for 1.7.10 and 11.14.0.1299 for 1.8), then drop the .jar file into "mods" in your .minecraft folder. This is pretty standard stuff -- look around for tutorials if you're confused. Software is open-source (BSD 2-Clause), icons are licensed under CC-BY-3.0. Source code is on https://github.com/airbreather/pig-manure-mod. 1.0.3: Fixed #6 so this will work on Forge builds 2189 and above. 1.0.2: Fixed #2 and #5. Also, apparently this works with 1.10.2. Tested with Forge build 2011. 1.0.2 (MC 1.9 version, scrubbed): Updates to work around a from a less advertised 1.0.1 for 1.9 that Forge build 1805 broke. 1.0.1: Fixing an issue with the pigs' digestion that caused them to lay manure droppings so repulsive that even the player would refuse to pick it up. 1.0.0: First release, adds manure that can be used as bonemeal in the world, can be smelted into bricks, and can be used as brown dye in recipes. By releasing pig-manure-mod under the BSD 2-Clause / CC-BY-3.0 licenses, we should have already given you permission to use this in any mod packs you want, so long as you remember to keep the LICENSE file intact. I am Joe Amenta, also known as AiryBreath on the Minecraft Forum, also known as airbreather on GitHub and miscellaneous other places. I am writing on behalf of myself and my wife, who worked with me to create the icons for pig-manure-mod. Effective immediately and retroactively, we hereby grant permission to redistribute unaltered zip archives of all past and present pig-manure releases, in addition to the permissions we've already granted by distributing pig-manure under its current licenses. Unless otherwise stated in advance of a future pig-manure release, this also applies to all future pig-manure releases. As a note, not as a binding contract, we have absolutely no intention of cancelling this permission. This additional permission is granted to all individuals to whom we are legally able to grant it. * For clarification, the zip archive of a given pig-manure release typically follows the format "pig-manure-x.y.z.jar", where "x.y.z" is the version number. * For further clarification, a particular zip archive is considered an "unaltered zip archive" of a particular pig-manure release if its contents are bitwise identical to the contents of a zip archive included with a pig-manure release. It is my opinion that according to the "LICENSE" files we've included in each release, this "additional" permission is a subset of the permissions we've already granted. I sign all really important stuff with this key or a subkey thereof: 0E479CD4. Dang, no 1.7.10 support! Well, it looks like a decent balance mod. I love this instantly and am installing it as soon as possible! I've added a 1.7.10 version to the head post. It's possible that having airbreathercore separate like this might mess with YAFM or YALSM if you have those installed too, but I think if you don't rename the YAFM or YALSM jar files, FML will do it correctly (it'll load airbreathercore-1.0.0.jar first because of alphabetical order). This is why I initially didn't put it out there, but I figure it's probably never going to be a real issue. If someone does have problems running this alongside one of those two mods, let me know and I'll package up special versions of those that won't have the issue. This is an awesome idea! Reminds me of Don't Starve and Beefalos. 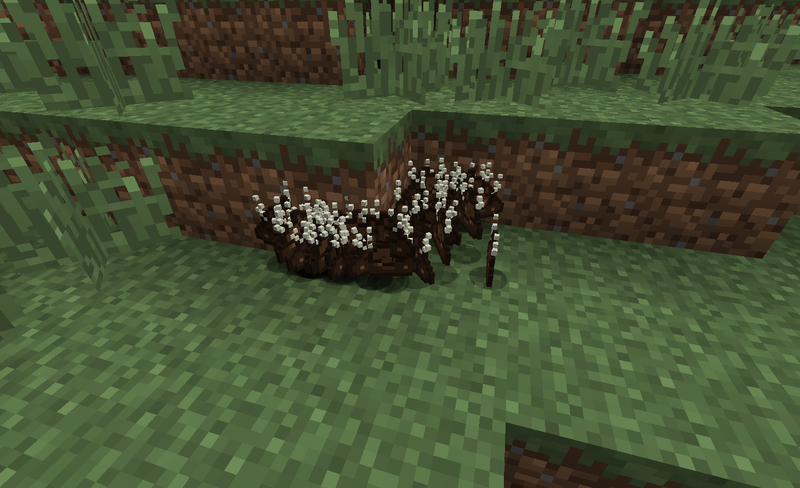 Minecraft needs Beefalos.. or just pig manure. It's another .jar file to put in the "mods" folder, download link is right next to the main link at the top post. It just contains a bunch of classes that I use in all my mods, doesn't do anything by itself but is needed in order to run this. Baby pigs do not poop. Clearly they're holding it all in for when they become adults, so they can release it all at once. Check out my Metroid Door and Custom Potions! Why only pigs, if I may ask? In vanilla, there's no compelling reason to have a pig farm instead of a cow farm (cows drop the same amount of food as pigs, plus they also drop leather), and every other farm animal has its own unique stuff in addition to the food: chickens lay eggs and drop feathers, sheep have wool, and rabbits have hide. The only special thing pigs do is give you something to dump your excess saddles onto, and that's not compelling. Now, with this mod, pigs aren't just worse versions of cows. I have been having a problem with ghost poop. cant pick up any of the items in the image. Hmm, my wife has been having this problem too, always around edges of blocks like that. I have no idea what could be causing this... in theory, this should happen with eggs from chickens too. Does it get better if you restart the client? if i logout of the world then the ghost poop goes away. but as i play for longer i get the ghost items again. its not only on the edges for me. Another interesting thing i have found is that it isn't all pigs that this happens to. its a proximity around the player i'm guessing loaded chunks. and that its ether time based or lag based. but i'm no modder.. I have been having a problem with ghost poop. cant pick up any of the items in the image. Fixed in 1.0.1 (see top post). Edit: wait about 10 minutes or so from the time of this post before you try downloading it, per this tweet. Creative idea I would have to say. Who would have thought about a pig poop mod? Well, now that its here, it seems great. Good job. For some reason I crash with a concurrent modification exception. Dunno what mod is causing this. My mod list and crash report are here. It seems to deal with the client renderer, as client.render is present several times in the crash report.